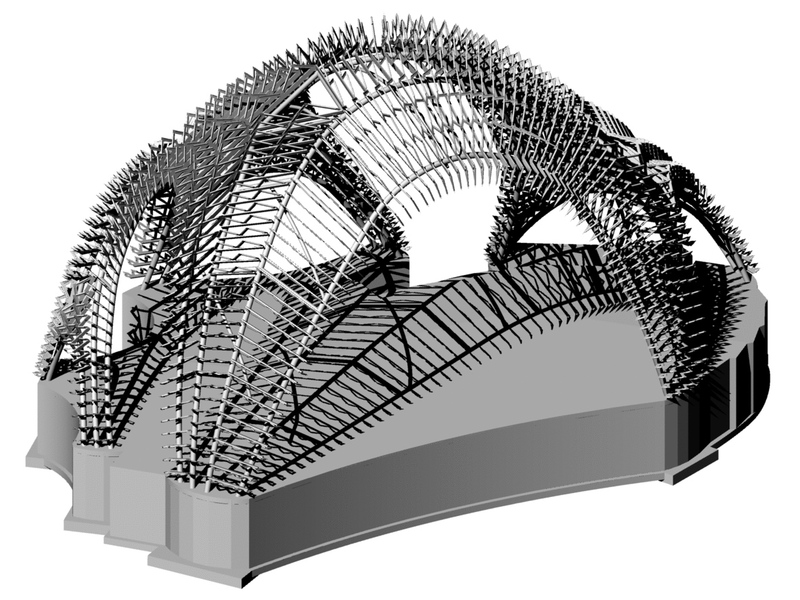 Rendering of the ZEPPS® profiles underlying the shingles of the Chrysalis skin. (Click for a higher-resolution version.) Compare to the first figure of the previous article in this series. Image © 2015 Arup; used with permission. tl;dr: I explain how the skin of the Chrysalis was fabricated and installed by A. Zahner Company. The previous article in this series discussed the steel frame that underlies the skin of the Chrysalis and enables the Chrysalis to support theatrical, wind, and other loads. This article explains how the complex and dynamic topography of the Chrysalis shell was made real, and how the colored aluminum shingles forming the skin of the Chrysalis were fabricated and attached to that topography. It features the work of A. Zahner Company of Kansas City, Missouri. 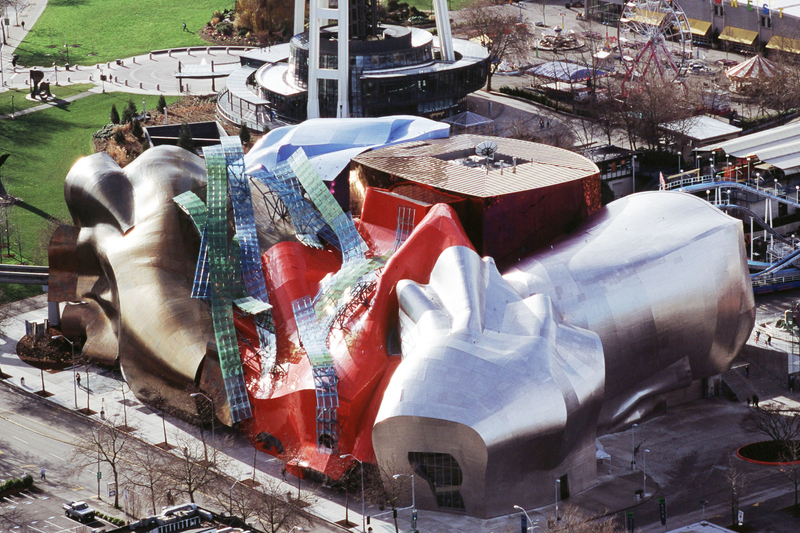 Aerial view of the Museum of Pop Culture, formerly the Experience Music Project Museum, in Seattle, Washington. (Click for a higher-resolution version.) Image © 2008 EMPISFM; used under the terms of the Creative Commons Attribution-Share Alike 3.0 Unported license. In typical construction practice a building is first designed and then contractors submit bids to do the actual construction—the so-called “design-bid-build” process. This process assumes that once a suitable design has been created any contractor will suffice to construct it, as long as they are suitably competent at their trade. However, given its unusual design the Chrysalis is far from being an ordinary building; the typical contractor would be at sea trying to figure out how to build it. Thus for the Chrysalis shell (i.e., everything above the relatively conventional structural concrete subfloor) the Inner Arbor Trust instead followed the “design-build” paradigm, in which a single contractor bears responsibility for the detailed design of the structure and all phases of its construction. That single contractor was A. Zahner Company of Kansas City, Missouri, commonly known as “Zahner”. How did Zahner come to be given this task? Its origin dates to the turn of the 20th century: Andrew Zahner, the son of a German immigrant, started a small business in Missouri that made metal cornices for buildings, tin ceilings, and metal ductwork for heating systems—one of hundreds of similar businesses across the United States. His son Leo Zahner and his grandson Leo Zahner, Jr., continued to operate it as a local Kansas City business under the names A. Zahner & Company and A. Zahner Sheet Metal Company. After Leo Zahner, Jr., returned from serving in World War II he expanded Zahner’s work in so-called ”architectural metal” products, including metal roofs, decks, siding, and façades. The year 1958, when his son Bill was still a toddler, saw A. Zahner & Company put in the lowest bid to replace the roof of the Liberty Memorial museum in Kansas City (now the National World War I Museum and Memorial), for a total price of $2,293—only $1,998 if Zahner were allowed to keep the copper panels from the old roof. Zahner’s evolution from a local and regional business began after Bill Zahner graduated from college and joined the company. Although he majored in civil engineering, Bill Zahner was and is as much an artist as an engineer, including working as an amateur sculptor. Just as in the 1930s Ove Arup became enthused about modern architecture and its use of reinforced concrete, in the 1980s Bill Zahner became excited about the possibilities of using architectural metals in contexts beyond the mundane—going so far as to later write two books on the topic.1 He began promoting Zahner’s capabilities at national industry trade shows and reaching out to visionary architects like Frank Gehry (then relatively unknown). Bill Zahner’s artistic bent was key to how Zahner evolved as a company and conceived of its mission. After he became the president of Zahner in the late 1980s, the soon-renamed A. Zahner Company began working on projects with ever higher profiles and ever more difficult challenges, like the American Heritage Center in Laramie, Wyoming (completed in 1993), with its distinctive dark copper roof, or the Museum of Science and Industry in Tampa, Florida (completed in 1995), with its doubly-curved stainless steel roof. Bill Zahner’s friendship with Frank Gehry also bore fruit in a series of projects, including a 1988 exhibit for the 100th anniversary of the Sheet Metal Workers International Association, a collaboration for the Weissman Art Museum in Minneapolis (completed in 1993), and then, and most significantly, in the creation in Seattle of the Experience Music Project (completed in 2000), a museum funded by Microsoft co-founder Paul Allen. ZEPPS panels installed on the steel frame of the Chrysalis prior to installation of the shingles. (Click for a higher-resolution version.) The triangles formed by the secondary steel were later filled in with ZEPPS panels fabricated on site, while gaps between the prefabricated panels were later covered by anodized aluminum sheet metal. Compare to the figure below. Image © 2016 Inner Arbor Trust; used with permission. In solving the problem of how to marry such surfaces to the underlying building structure, Zahner invented the Zahner Engineered Profile Panel Systems, or ZEPPS®. The ZEPPS process was made possible by the same technological trends later leveraged by Marc Fornes and his colleagues, including in particular the development of advanced 3D modeling software and its ability to interface to machine tools via Computer Numeric Control (CNC). 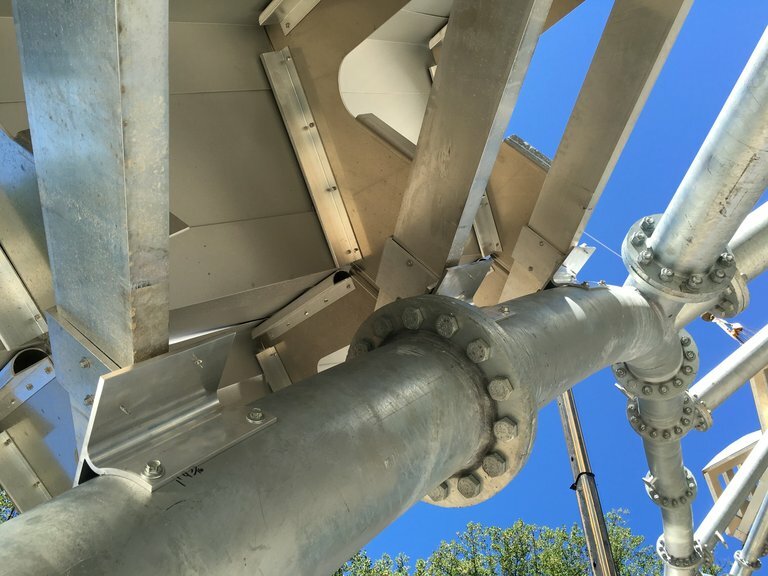 Zahner used these technologies to simplify the task of fabricating and installing the complex metal surfaces by reducing them to a set of customized individual panels, each of which could be separately fabricated and installed onto the building structure. The ZEPPS process and related technologies formed the basis of Zahner’s growth in both revenue and reputation in the 21st century.2 The fifth generation ZEPPS process was key to creating the Chrysalis. A map of how the prefabricated ZEPPS panels were installed in the Chrysalis steel frame. (Click for a higher-resolution version.) AB, EB, GB, HB, IB, LB, OB, PB, and PB mark the bottom of the nine legs of the Chrysalis, for which ZEPPS panels were fabricated on-site. Compare to the figure above. Image © 2016 A. Zahner Company; used with permission. Viewed in isolation an individual ZEPPS panel is a relatively prosaic object: a set of pieces of aluminum (referred to as “profiles”, and resembling trusses or purlins in traditional structures), with one side of each profile attaching to the underlying structure and the other side attaching to a sheet of metal forming part of the exterior surface. The true sophistication of the ZEPPS process is apparent only when contemplating a collection of ZEPPS panels fabricated for a particular structure, and the underlying computer technology that makes their fabrication and installation possible: In a structure like the Experience Music Project Museum or the Chrysalis each and every part of the exterior metal surface may have a different degree of curvature, may be curved in two directions and not just one, may attach to the underlying structure at different angles, may impose a different set of loads, and may need customized instructions for how to install it. Zahner designs ZEPPS panels using the CATIA software discussed in a previous article: given a 3D model of the underlying structure and a 3D model of the desired metal surface, Zahner determines how many ZEPPS panels are needed, what shapes they must take, and other characteristics. 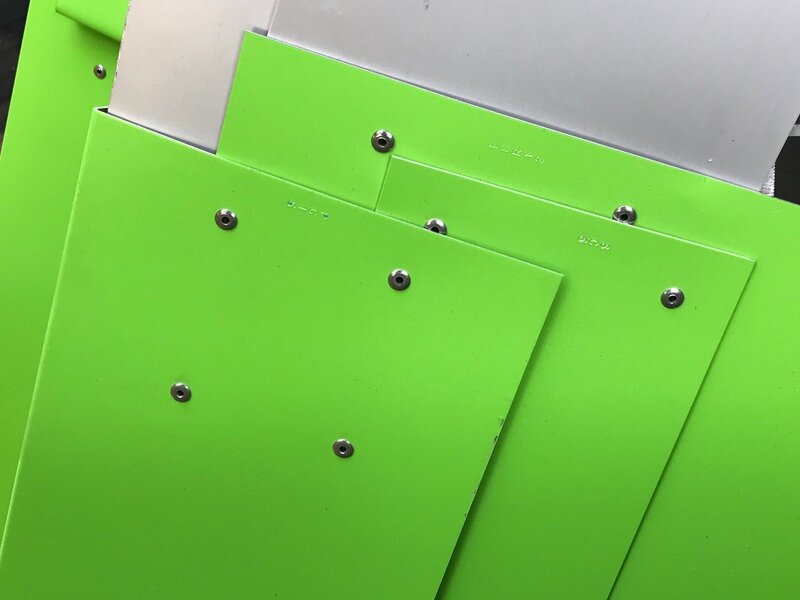 For example, the individual profiles within a panel must be spaced at a suitable distance in order to bear the weight of the metal skin. Based on the loads imposed on the ZEPPS panels, they may also be made out of slightly different material, for example, lower-strength aluminum vs. higher-strength aluminum. A close-up look at the underside of a ZEPPS panel and the curved saddle brackets by which it is installed on the steel frame of the Chrysalis. (Click for a higher-resolution version.) Image © 2016 Inner Arbor Trust; used with permission. In total the Chrysalis features 88 ZEPPS panels containing a total of over 300 profiles. 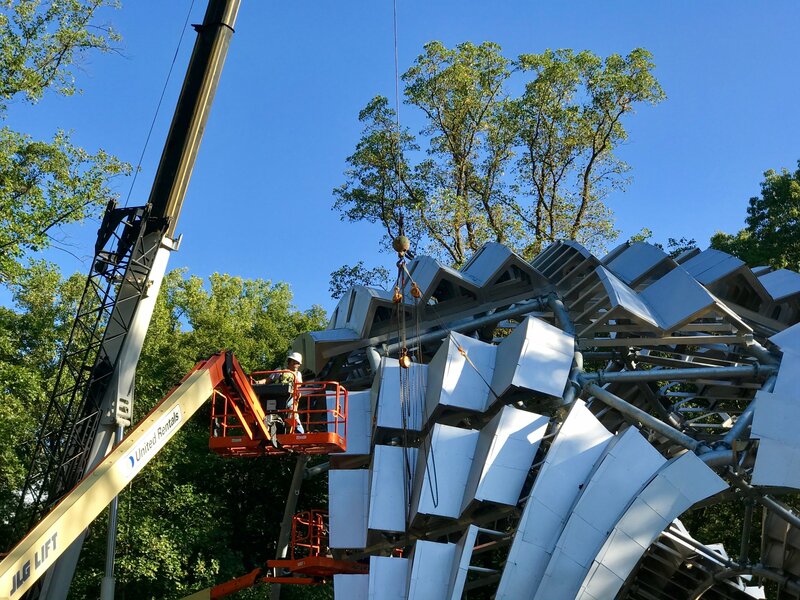 Most of the panels were fabricated at Zahner and shipped to the Chrysalis site, but 16 were fabricated on site: those covering the seven triangles formed by the steel frame and those making up the segments of the nine legs of the Chrysalis from the level of the stage floor down to the ground. Each ZEPPS panel was pre-positioned on the ground and tilted to the correct angle before being hoisted to its designated position on the steel frame. The orientation of the panels was further adjusted while they were suspended (using a system of chains and pulleys), so that when the workers guided them into place they would match up with the underlying steel frame as closely as possible. The panels installed in the Chrysalis also have clear anodized aluminum sheet metal attached to them. (See the figures above and the figure below.) Although this appears superficially similar to the external metal surfaces of other Zahner projects, it instead forms a substrate on which can be attached the true outer surface of the Chrysalis, factory-painted aluminum shingles in various shades of green, as well as an interior surface as discussed below. Close-up of aluminum shingles of the Chrysalis skin, showing how the shingles were riveted to the sheet aluminum of the underlying ZEPPS panel. (Click for a higher-resolution version.) Note the codes on the upper edge of each shingle specifying its type. See also the figure below. Image © 2016 Inner Arbor Trust; used with permission. In the Experience Music Project Museum and other Zahner projects the metal skin is intended to appear as an unbroken surface to the viewer. The goal therefore is to minimize as much as possible the appearance of any seams between the metal sheets attached to the ZEPPS panels. The Chrysalis skin, on the other hand, is designed to have a highly scaled texture and variegated coloring. Hence it is formed of overlapping shingles, with the boundary between one shingle and the next quite apparent. While the shingles break up the surface of the Chrysalis into thousands of pieces (8,200 shingles in all), through their color they also unify the whole of the structure into a single organic form. As noted in a previous article, the shingles are painted in four different colors of green, with the various colored shingles placed on the structure to provide the appearance of a smooth color gradient from a darker green at the bottom to a lighter green at the top (a technique known as “dithering”). Because the shingles will be exposed to the elements and (in the lower sections of the Chrysalis) to human beings, they are painted using Valspar Fluropon, a special architectural coating designed for exterior metal surfaces to provide resistance to UV rays, dirt and stains, and graffiti while retaining its original color and gloss over the years. 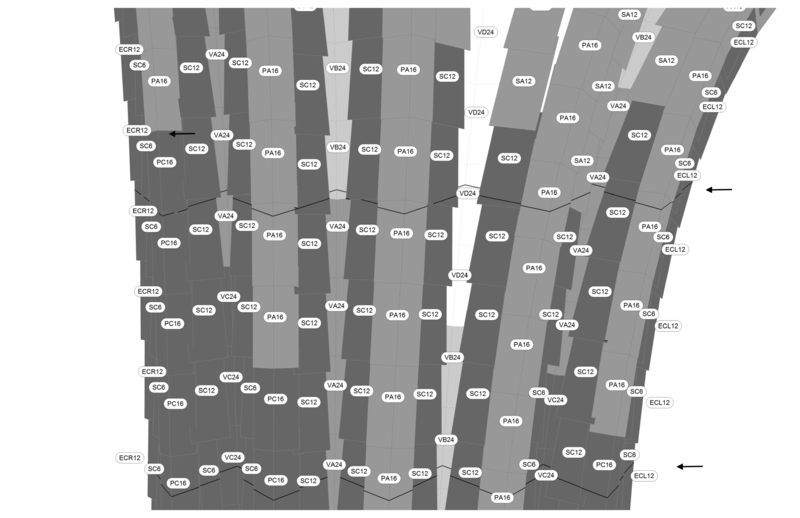 The skin of the Chrysalis, including the ZEPPS panels and the shingles, thus forms a giant three-dimensional jigsaw puzzle, with all pieces needing to be precisely designed and fabricated so that they will come together easily without gaps or misalignments and be installable by a relatively small group of people. Unlike a jigsaw puzzle, the skin must also bear loads without failure or any significant deformation, adapt to changing temperatures throughout the four seasons, and retain its structural integrity and visual beauty over the years. Zahner is arguably one of the few contractors, if not the only contractor, that could have accomplished this task within the timeframe and budget allotted to it. The next article in this series will discuss the structural concrete subfloor of the Chrysalis and related construction on the site. 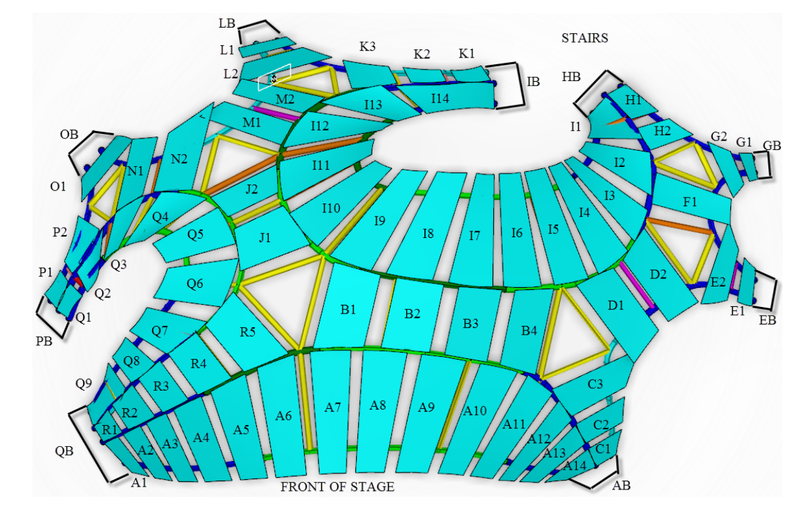 A map of how shingles were installed over the ZEPPS panels on one part of the Chrysalis. (Click for a higher-resolution version.) The alphanumeric codes indicate the type of shingle to be placed at each location. Compare to the figure above. Image © 2016 A. Zahner Company; used with permission. “William Zahner markets metal company on complex know-how”, by Don Lee, Kansas City Star, February 11, 1992 [paywalled]. An article from soon after Bill Zahner became president of A. Zahner Company. “Zahner celebrates 100 years proving their mettle in metal”, by Randolph Heaster, Kansas City Star, November 25, 1997 [paywalled]. Discusses the past and present of A. Zahner Company on the occasion of its celebrating its centenary. “Transcript from Interview with L. William Zahner & Crosby Kemper III”. A 2015 interview in which Bill Zahner discusses the history and working methods of A. Zahner Company. “Kansas City, Powerhouse of American Architecture”, by Kriston Capps, The Atlantic, November 2015. A profile of A. Zahner Company. See also earlier profiles in Wired and Metropolis. “Math of Architecture, Architecture of Math” [67-minute video]. An event on November 3, 2015, sponsored by the Inner Arbor Trust to promote the Chrysalis project. Includes a presentation by Bill Zahner starting at 46:44, discussing various Zahner projects, including most notably the Petersen Automotive Museum in Los Angeles. “Full STEAM Ahead” [62-minute video]. An event on November 3, 2015, sponsored by the Inner Arbor Trust to promote STEM topics associated with the Chrysalis. Includes a brief presentation by Bill Zahner starting at 50:20 discussing the work of A. Zahner Company and the use of architectural metals. “ZEPPS®”. An overview of Zahner’s ZEPPS technology, including a link to a 144-page document containing more details and a portfolio of projects. “A. Zahner Company Customer Story”. A video and written case study describing how Zahner used Dassault Systèmes’s 3DEXPERIENCE platform (including CATIA) and its Design for Fabrication on Cloud service to fabricate the Chrysalis. “Design-build”. A Wikipedia article providing an overview of the design-build concept. The Chrysalis portion of the Inner Arbor presubmission community presentation (December 2, 2013).